Keystone of the GAZelle production line with 4x2 drive is model called 3302. 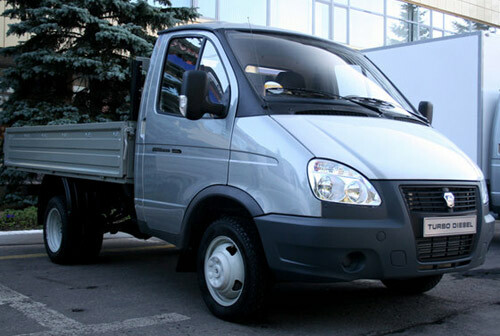 3302 is vehicle with spacious cabin of Single Cab type, mounted on solid ladder type frame. Even 3302 do not offer 4x4 drive, massive chassis can not deny origin in Russian technique. Both front and rear axles are solid, mounted on leaf springs. Those can be strengthened on demand, which will lead to bigger payload of your new truck. Do not forget to ask our salesmen about these non-standard options in contacts menu. 3302 vehicles are the most chosen vehicle for dump trucks and lorry platform trucks. In last few years light container carriers are booming. Thanks to 3.5 total weight, GAZelle can still be used everywhere, where other trucks are forbidden to enter. Complete system of container carrier platform weights only 390 kg! Thanks to such a low weight, you still have more then 1000 kg payload for your cargo! If you are interested in 3302 model, and if you often ride out of the roads and you never want to get stuck at the muddy meadow, inform yourselves about 33027 model, which offers 4x4 drive, plus all the advantages of 3302.